An IRS, unlike a solid rear axle, has a fixed differential housing. It does not move when the suspension travels. on a two post lift or on jackstands with the suspension in full droop. 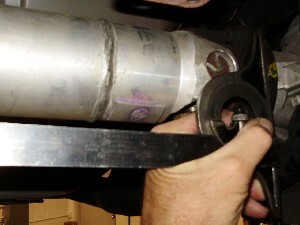 Lay the tip of the non-moveable portion of the angle finder on the rear face of the transmission tail shaft housing as shown above. 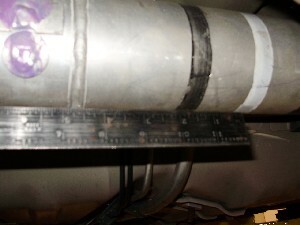 Be sure the scale is locked in the angle finder so it cannot slide. Match the scale to be parallel with the drive shaft, then lock the angle finder thumb screws to secure the angle setting. Read the angle and write it down to reference later. Now lay the tip of the non-moveable portion of the angle finder on the differential pinion flange face. 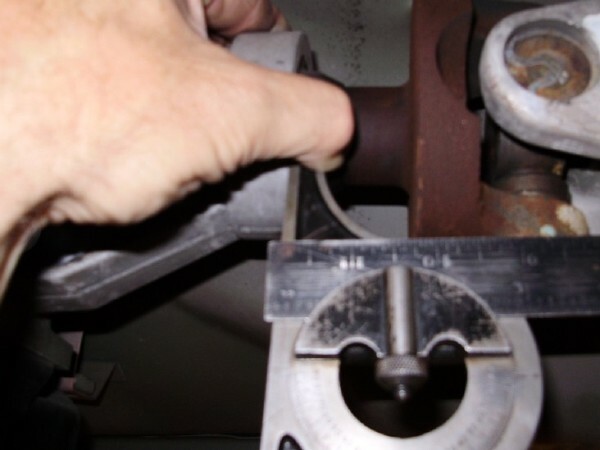 Again, adjust the scale to be parallel with the drive shaft and lock the angle finder thumb screws to secure the angle setting. Take the angle reading and compare it to the reading that you recorded earlier for the front. 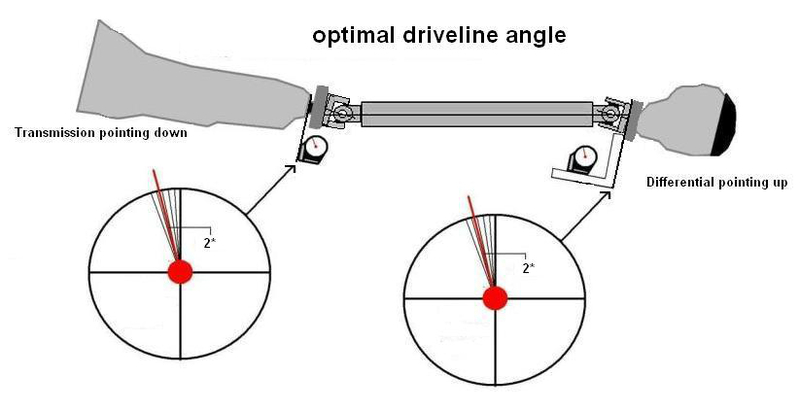 The driveshaft angles must offset each other. then the rear pinion angle must read -2 degrees (88 degrees on the angle finder). is raising the front of the diff as high as you can get it without it hitting the subframe. This will not be perfect, but it will be an improved driveline angle compared to the way the car came from the factory. diff lowering mount or the complete bushing kit FT 5001 which includes the FT 1401 lowering mount. The diff angle cannot be set until the subframe goes back in the chassis. No, the car does not have to be level doing it this way. WARRANTY AND DISCLAIMER: FULL TILT BOOGIE RACING, INC., A WISCONSIN CORPORATION (“SELLER”), HEREBY WARRANTS THAT THE ENCLOSED AUTOMOTIVE COMPONENTS ARE FREE FROM DEFECTS IN WORKMANSHIP AT THE TIME OF SHIPMENT, BUT DISCLAIMS AND EXCLUDES ANY AND ALL OTHER EXPRESSED OR IMPLIED WARRANTIES REGARDING THE ENCLOSED AUTOMOTIVE COMPONENTS. PURSUANT TO THE UNIFORM COMMERCIAL CODE, ARTICLE 2, SECTION 316, SELLER SPECIFICALLY EXCLUDES ALL WARRANTIES OF MERCHANTABILITY AND FITNESS FOR ANY PARTICULAR PURPOSE. 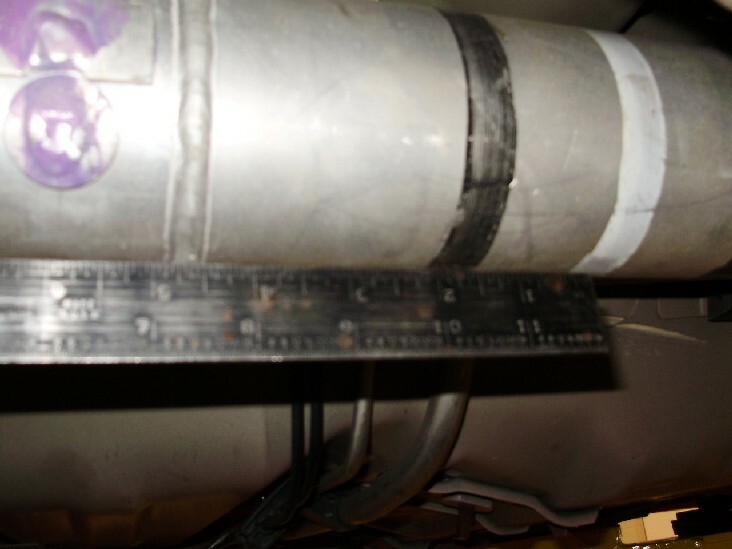 SELLER DIRECTS PURCHASER TO FULLY INSPECT AND EXAMINE EACH ENCLOSED AUTOMOTIVE COMPONENT BEFORE INSTALLATION AND TO USE EACH AUTOMOTIVE COMPONENT AT PURCHASER’S OWN RISK. IN THE EVENT THAT ANY AUTOMOTIVE COMPONENT IS DEFECTIVE UPON PURCHASER’S RECEIPT, PURCHASER’S SOLE REMEDY SHALL BE TO RETURN THE DEFECTIVE AND UNUSED AUTOMOTIVE COMPONENT TO SELLER WITHIN FIFTEEN (15) DAYS AFTER PURCHASER’S RECEIPT AND REQUEST IN WRITING EITHER A FULL REFUND OR A REPLACEMENT, WHICH SELLER SHALL SHIP TO PURCHASER AT NO ADDITIONAL CHARGE.